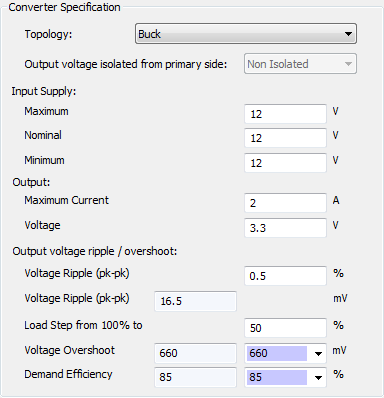 In this tutorial, we will design a voltage mode Buck converter. Note that this value is chip dependant. For the UC3823 chip that we are using the typical value from the datasheet is 1.8V. If not already in context, click on the "Frequency Response" tab on the right hand side to view the simulated Bode plot. Under the “Bode Plot” section of this tab, make sure that only “Loop” is ticked. This will display the simulated loop response. See that the simulated crossover frequency and phase margin are displayed at the top of this tab. Click on the "Analog (Non-Isolated)" tab. The component values required for the Type III compensator have been automatically calculated. In this example we will be using the UC3823 PWM controller from TI to implement the controller. The voltage reference from this chip is 5.1V (from the datasheet). But, in this example, we divide this by 2 using a potential divider. 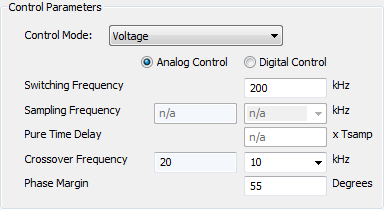 Therefore in WDS please make sure that the “Error Amplifier Reference Voltage” is set to 2.55V. In WDS, click on the "Circuit" tab (right hand pane) and view the circuit diagram for the Type III compensator. Please study the circuit diagram and identify the location of the Type III compensator components. WDS will always use the user defined values instead of calculated values. So now that you have changed the component values to their NPVs, your crossover and phase margin will also have changed. The simulated crossover frequency and phase margin have changed because you have now entered the values of the components used on the actual PCB, which are slightly different to those calculated by WDS. Thus your compensator poles and zeros are slightly different from the ones calculated by WDS. 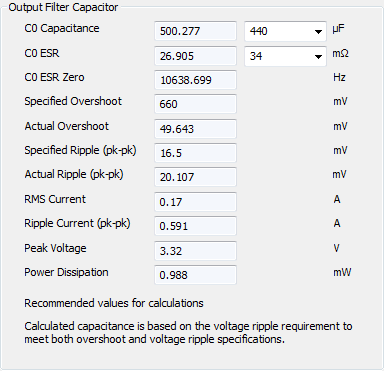 ​This tab toughly estimates the total power loss in various components of the power supply. 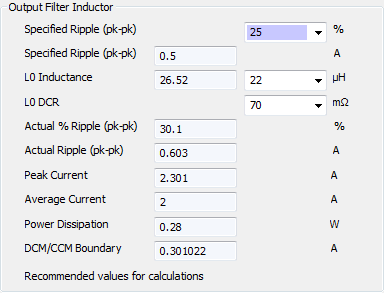 Total power loss budget (PLB) is estimated based on the user’s efficiency requirements and this is displayed at the bottom light hand side of the WDS window. A warning is displayed of the losses exceed the total PLB. This is the final summary of your design. It includes all the parameters calculated by WDS including all the voltage and current stresses on the devices in addition to all the frequency repose Bode plots. When your design is complete, you can save this as an rft file by pressing the “Save Summary As” button or insert on your own reports by simply copying and pasting. Finally pressing “Generate and Email Transformer Design to” allows you to generate an email with all the parameters relevant to the transformer which you can send to your magnetics supplier of choice. This is an extremely power full feature full explanation of the available simulations is given when you click on this tab.